E+motion® bandages are medi’s Performance Collection. They combine functionality and design. With optimised new features, this still young collection is now going into the second round: Extra stable and flexible, it ensures perfect support under high stress conditions. People who are very active benefit particularly from this: Competitive athletes and recreational sport enthusiasts who place stress on their joints and their back, both at work and during leisure time. E+motion® bandages are medical aids and lifestyle products at the same time; they combine medical effectiveness with exclusive features and a sporty look. In order to be fit again and fast, active exercise is essential. During physical activity, the E+motion bandages in medi’s award-winning sporty design offer stability and protection. They are made of high-elasticity active fibres and functional merino fibres: for more support and plenty freedom of movement. The high-tech material also creates a pleasant cooling on the skin: The capillaries transport the moisture from the skin to the surface of the bandage where it can evaporate. Performance made in Germany. What happens during an injury? Injuries can lead to joint instability as well as to swelling and joint effusion or even irritative conditions. This throws the whole body off balance. With their compressive fabric, medi supports promote the healing process and ensure that users are soon back on their feet and moving around again. The proprioceptive effect stabilises and relieves stresses on the joint as well as easing pain. The integrated silicone quartz pad exerts a soothing massage effect whenever you move. It also stimulates circulation to the tissues. 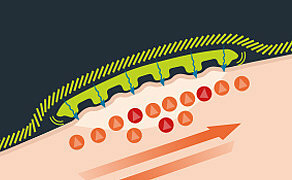 This enables the body to reduce swelling and oedema more efficiently and boosts the healing process. You can also follow medi on our Facebook page - Follow us now! A strong brand. A wide-ranging product range. Holistic concepts. 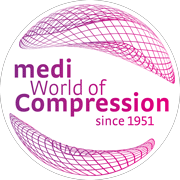 medi's World of Compression: a signpost to the future with 65 years' competence in the field of compression. Your partner for the highest demands on quality, innovation and design.